Fate/Grand Order panel announced a North America exclusive Thanksgiving Special event along with a slew of rewards for players. The Thanksgiving Special includes daily log-in bonuses and special Mana Prism exclusive items which include a limited-time Craft Essence and two different grab bags. The event also marks the emergence of highly anticipated «5 (SSR) Servant Scáthach, lovingly referred to as Shishou or teacher/master in Japan. Additionally, the game will also give away ten Saint Quartz to celebrate their participation at Anime NYC. Released in June of this year, Fate/Grand Order quickly exceeded one million downloads and is currently available in North America on the Apple App Store and Google Play. Prior to the game’s launch, Creative Director, Yosuke Shiokawa, hinted that events centered on American holidays would be a possibility in the future and the FGO Thanksgiving Special marks the first event specific to North America. As a small token of appreciation and in honor of American Thanksgiving, Fate/Grand Order will launch special daily login bonuses for 3 days starting on November 23rd (UTC). Perhaps the most exciting announcement was the Thanksgiving Celebration Summon from November 22nd (UTC) to December 1st 3:59 (UTC), which is a 10x Summon that will guarantee one of nine featured «5 (SSR) Servant. 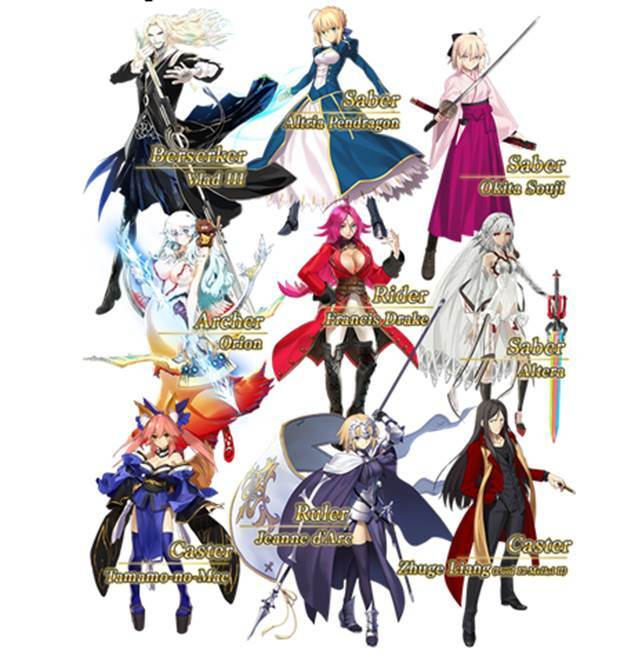 The featured «5 (SSR) Servants include Altria Pendragon, Altera, Okita Souji, Tamamo-no-Mae, Orion, Vlad III, Francis Drake, Zhuge Liang (El-Melloi II) and Jeanne d’Arc. This summon is only available once per account and it’s a good chance for the players to obtain one of the many powerful Servants in the game.